Saskia de Brauw is a leading international model and artist, born in the Netherlands of Dutch and Scottish parentage. Saskia’s artwork incorporates elements of photography and performance art as well as text and graphics. 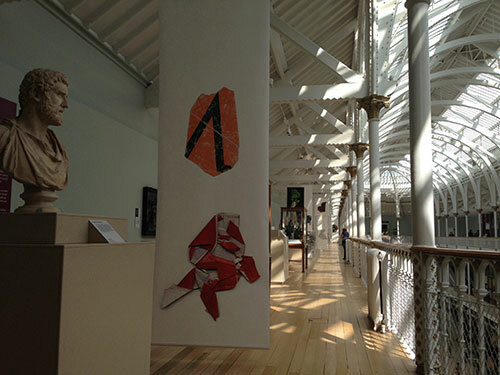 The exhibition we were installing, The Accidental Fold is a collection of 21 prints, hung intermittently throughout the Sculpture Gallery on Level 5 of National Museum of Scotland. The prints are photographs of a variety of found objects printed onto cotton, tissue and rice papers. These found objects vary from locks of hair and bird feathers to detergent bottles and broken mirrors. Stuart on the genie lift measuring for wire placement. The 1-3m long prints are layered in some sections and hang alone in others, each piece reacting to one of the classical pieces of sculpture which sit alongside as part of our permanent display. The work sets up a lovely juxtaposition between our sculpture collection and her artwork. Solid stone, marble and bronze sculptures versus the butterfly wing delicate and ghostlike images. Looking at the work in situ now, peacefully hanging in mid-air, so fragile they look as though they’re being held up by sunlight, it’s hard to imagine just how intense it was to get them up there. 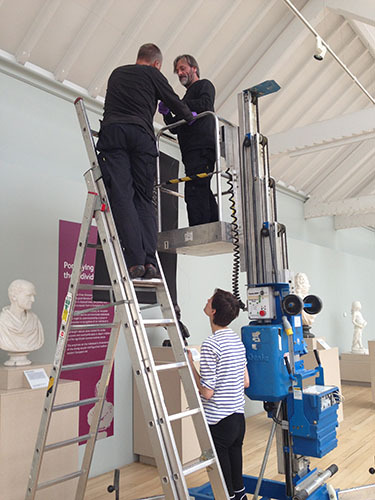 Installing them was a real challenge, partly because of the height issues we faced in fixing these prints to the roof beams five floors above the Grand Gallery and partly because of how delicate the prints were. Negotiating permanent display cases with a large gene lift, a set of ladders and 21 sheets of easy-to-tear three metre-long sheets of tissue paper meant that moving slowly and precisely was the order of the three days which followed. 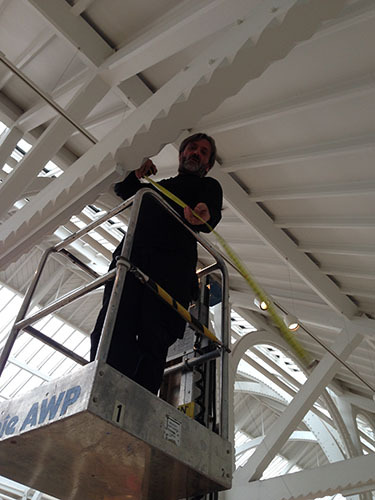 Stevie and Stuart, our Exhibition Technicians, did an amazing job, first fixing the wire along the beams to hang the prints from and then the continuous climb up and down ladders or yo-yoing up and down in the genie lift. Thankfully our intrepid heroes do not suffer from a fear of heights! Attaching rings to the wire: Stevie, Stuart and Saskia. We made sure to stick to very strict regulations about working at height and had to allow the correct distance from the balcony’s edge at all times. As intense, physically exhausting and challenging exhibition installations can be, it is also tremendous fun. Saskia was great to work with and Stuart was particularly impressed to find out she had met his hero, David Bowie. Saskia was equally impressed with our Elvis impressions and impromptu Scottish folk song renditions. I would encourage you to go and experience walking among the artworks and as you gaze upon the giant image of a discarded orange peel, think that there can be beauty in the ordinary and there’s a real optimism in that. Saskia’s work allows us to take a second look at something, to see it from a different perspective. Just as objects, seen in their true light. The finished exhibition in the Sculpture gallery. We are proud to be hosting Saskia de Brauw’s exhibition The Accidental Fold in partnership with the Edinburgh International Fashion Festival. 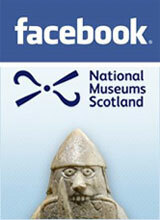 The exhibition is in the National Museum of Scotland’s Sculpture Gallery on Level 5 until Monday 28 July . Find out more on Saskia’s blog. 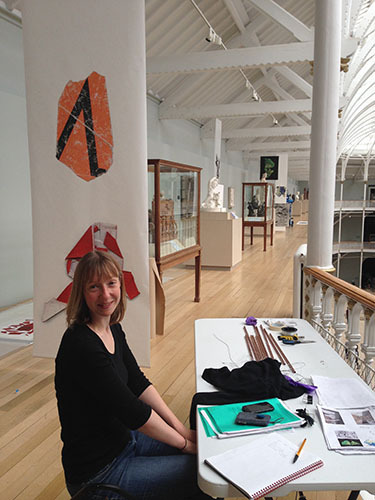 A blog where staff at National Museums Scotland can share our work and experiences. Welcome to the feast! A comet’s tail or Halley’s left overs!